Recently, the New York Post printed a Gallup poll story titled, “In Job We Trust.” It showed the percentage of adults who think certain professions have very high ethical standards. Nurses led at 82 percent. Clergy found their spot at 41 percent. Car salespeople were the lowest at 10 percent. Where would car mechanics rate in the hierarchy? Probably below 10 percent? 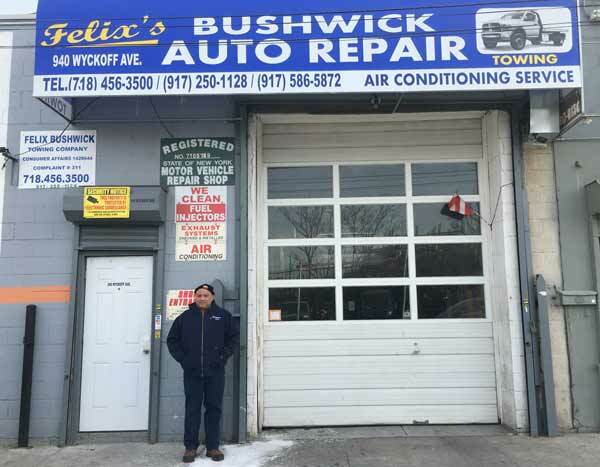 It is a “top notch,” highly-rated car repair business, owned and operated by a mechanic of rare integrity – Felix Rosado of Felix Bushwick Auto Repair. Puerto Rican by nationality, Rosado is a faithful parishioner at St. Martin of Tours Church on Hancock St. His immaculately clean, tidy and well-maintained repair shop can be found a very short distance from the church. “I believe strongly in quality control,” explained Rosado. “Likewise, if my work is not done correctly, I could never in good conscience release anyone’s vehicle. For me, honesty is at the forefront – and I never forget that the man upstairs (God) doesn’t like ugly! Rosado shared a rather eye-opening story with regard to honesty. Recently, a group of young women visiting from California were told by a mechanic that they needed certain repair work to the tune of $800. They decided to get another opinion and searched for a mechanic who had high ratings on the internet. Rosado said,“When they came to me, I saw that the repair work the other mechanic supposedly diagnosed was totally incorrect. The work they needed cost about $80 and not $800.” He was quick to note that this was a perfect example why people have trust issues with car mechanics.